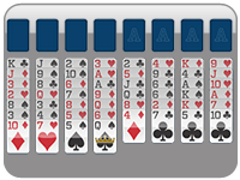 Eight Off Free Cellis one of the oldest members of the FreeCell game family. 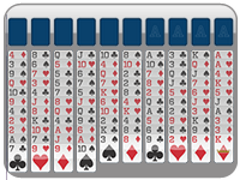 Eight Off is played with one deck of cards and in addition to four foundational piles, there are eight free cells in which to move cards (four more than FreeCell and Baker's Game!). Eight Off Free Cell Foundations, located vertically on the left are built by suit from Ace to King. In the tableau there exist eight columns of six cards each. 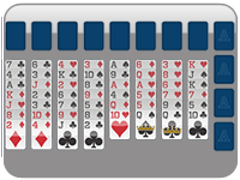 The remaining four cards are placed into four of the eight free cells on the top. You may move cards in and out of these "free cells" at any point in the game. Tableau piles are built down by alternating color. Any card/group of cards can be placed into an empty tableau pile. 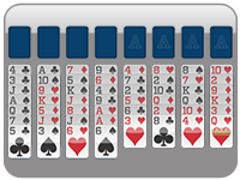 Eight Off Free Cell tends to be a bit easier than FreeCell, but do not take it lightly. It still takes lots of thought and skill, so have fun with it and get to know the true roots of FreeCell Solitaire.